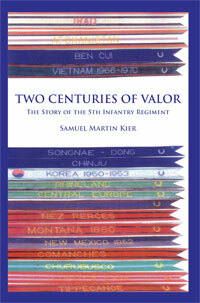 is the first fully comprehensive historical account of the 5th United States Infantry Regiment. It chronicles one hundred ninety-nine years of active service of the regiment as it fought in most of its nation’s wars from the War of 1812 to the War on Terror, and during its many years of peacetime service from the Minnesota wilderness to the Sinai Peninsula. The information was derived from earlier regimental histories, monthly command and after-action reports, award citations, archived newspaper accounts, biographical sources and correspondence with dozens of living veterans from World War II to men who are currently on active duty. It is a story of courage, sacrifice and missions accomplished. — Butch Sincock, Executive Director, 25th Infantry Division Association. — Major General Andrew H. Anderson, USA (Ret. ), (Commander, 1st Battalion, 5th Infantry, Vietnam, 1968.